You are here: Home » Taxonomy And Metadata » Can Enterprise Taxonomy Management Survive Analyst Reticence – And Does Anyone Else Care Anyway? Can Enterprise Taxonomy Management Survive Analyst Reticence – And Does Anyone Else Care Anyway? Writing on LinkedIn, Mike Doane has published an article with the title Can taxonomy survive the Trough of Disillusionment? In the item, he discusses the recent featuring of Enterprise Taxonomy and Ontology Management on the Gartner 2016 Hype Cycle. Mike speculates whether taxonomy can survive its inclusion in the ‘Trough of Disillusionment’. This is a good article and I will make it clear that while I am going to robustly critique the Gartner diagram he has referred to, I fully agree with his own conclusions. 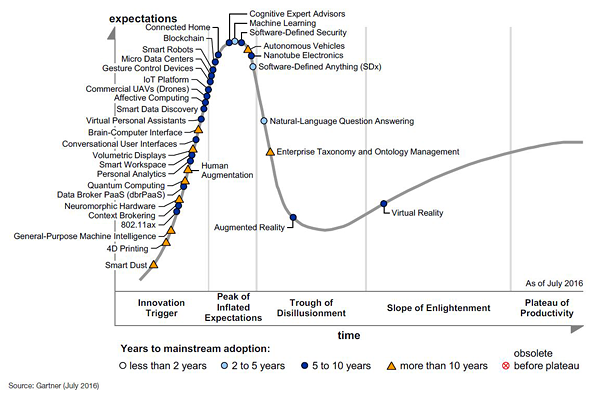 The Gartner Hype Cycle gets cited frequently in IT circles and the inclusion of some new technology or other is generally greeted with delight by those involved, who attribute this as evidence that they are making progress towards adoption and all the financial rewards that should result. Having observed the output of sections of the IT analyst community in various capacities, however, I have a more jaded opinion of their motives and the rationale behind how and why these diagrams get drawn up. As I will discuss later, I believe enterprise taxonomy is getting only grudging acceptance by Gartner (and most of their competition). Not all analysts are the same, but many simply copy their homework from each other and re-publish someone else’s thoughts. If you want to save a decent sum of your shareholder’s cash, you could do far worse than come up with your own opinion about a number of IT trends rather than buying a second-hand one from some people who may not know a great deal more about a subject than what a morning spent with Google has equipped them with. Astute readers will note the distinct similarity of the shape of these two curves. The Gartner chart smooths over the temporary retracement at the top of the cycle, prior to the ‘trough of disillusionment’ aka ‘blow off phase’ (I personally prefer Jean-Paul’s description). Missing also is the long ‘smart money’ preliminary stage and Gartner make more of the ‘slope of enlightenment’ (or ‘mean reversion’) extended tail-end to the right of their diagram. Although the focus of attention (and subject matter) is different, the patterns exhibit the same set of characteristics. The behavioural aspect undoubtedly has many similar features as well. These get more intriguing when you look at the older editions of Gartner’s Hype Cycle. Perhaps I misunderstood this, but when I have read about these in previous years, I thought the technologies described traversed the curve and either made it all the way through to the plateau of productivity, fell off the chart somewhere in the pits of despair or possibly slid back down to the foothills of unfulfilled expectations (and given that this is IT we’re talking about here, that last one seems likely to be the most common outcome). Inspecting the 2013, 2014 and 2015 diagrams, however, the runners and riders seem to change quite a lot. I looked quite hard to find Enterprise Taxonomy and Ontology Management in earlier charts, but this subject only makes its debut halfway through the blow-off phase in 2016. About three quarters of the story has been skipped and Gartner have come in towards the end, at the point where it looks like the protagonists are in grave danger of succumbing to their foes in the trough of disillusionment. I contend that The Gartner Hype Cycle is actually a snapshot of Gartner’s own sales and marketing strategy circa late 2015 (when they will have drawn this up). This is a method for them to signal to prospective clients that they are tuned into what they expect to be the hot topics each year. As those readers who have been involved in software startups will be aware, if you start to make some progress with your marketing and brand awareness activities, it won’t be long before the fellows from Gartner begin sending you emails and making calls with various packages to appear in the analysis documents they sell to end users (which vendors also have to pay for). 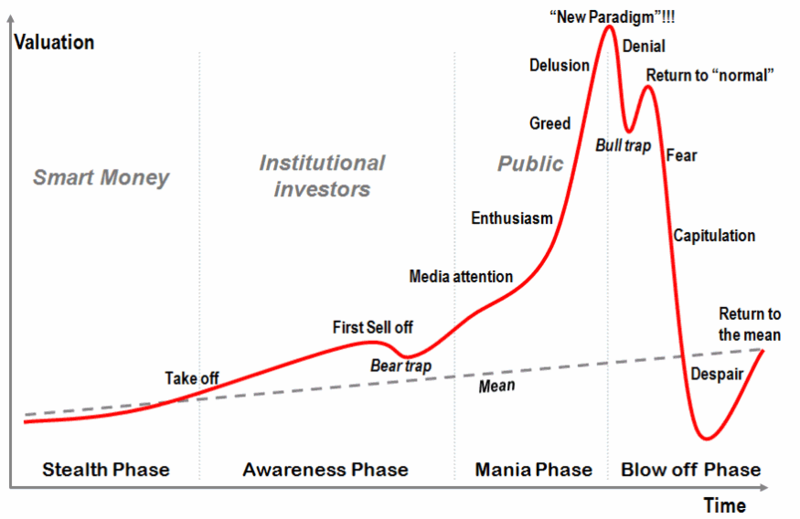 As such, the hype cycle diagram is directed as much to the sellers as it is to the buyers. In further support of that conclusion, I note that one of the questions vendors tend to get asked by Gartner and their ilk is whether or not they are funded currently, which both qualifies them as potential sales leads and also gives them an indication about where the ‘smart money’ are placing their bets (although I question the description ‘smart’ in a few cases, especially as it relates to technology private equity investment). Entertaining though this diversion into world of behavioural economics and analyst sales strategies is, let’s get back to taxonomies. I suspect the reason taxonomy management has not made an appearance until now is that a lot like Digital Asset Management, analysts regarded it as some dry and esoteric subject that only librarians and other data geeks cared about, however, now the level of interest in it is so great that they cannot be seen to ignore it. I discussed Virtual Reality a few weeks back, although I have seen a few articles about it and PR shots of Mark Zuckerberg wearing headsets etc, I don’t actually know anyone at all who uses this for their job (I can’t even think of anyone who has the gear for entertainment purposes either, although perhaps I just don’t socialise with the right kind of people). By contrast, I am aware of numerous individuals who consciously make use of taxonomy management technologies on a daily basis and probably hundreds of thousands of others who do so without realising it. I simply don’t accept that VR has reached the ‘plateau of productivity’ (or the ‘is now finally making a profit after years of hemorrhaging cash’ stage) whereas I know that enterprise taxonomy management is beginning to hit the sweet spot in terms of enterprise adoption because the subject comes up all the time when I talk to clients. The reason is obvious and I have discussed it on DAM News recently, if everyone across the business uses a shared taxonomy and series of metadata standards, potentially billions of dollars can be saved on enterprise integration expenditure and a whole slew of other efficiencies become feasible to implement at far lower cost than they have done in the past. I fully accept that enterprise taxonomy management has not yet reached anywhere near what you might call a ‘plateau’, but suggesting that VR is at a more developed stage of adoption reads like its some kind of very dull science fiction to me for which no tangible proof yet exists. As Mike points out in the article, Gartner are giving taxonomy management ten years before it attains mainstream adoption. I suspect that it is Gartner themselves who find taxonomy and ontology management to be a ‘trough of disillusionment’ because they failed to identify its wider significance. The sub-text of them estimating a decade for it to attain adoption (while natural language processing will allegedly take just two years) is because they would rather that it just went away so they could get to talk about something they, themselves, find more interesting. As most people who have operated a business in some capacity will know, the stuff that tends to generate the best ROI (as measured in money terms, i.e. cash you can spend) tends to be fairly prosaic and a bit dull for anyone without a stake in the outcome. If you buy into the idea that there is a digital transformation process taking place in enterprises where previously non-digital or offline activities are modelled and replaced by digital equivalents which are easier to manipulate and adapt, a taxonomy (or ontology) becomes a critical architectural piece of the whole edifice since it provides the point of reference that gives everything the necessary order and structure. In this context, subjects like operational efficiency are where enterprise taxonomies are likely to become integral elements and that is why they aren’t going away (you can also include distributed ledgers in that bracket for similar reasons).